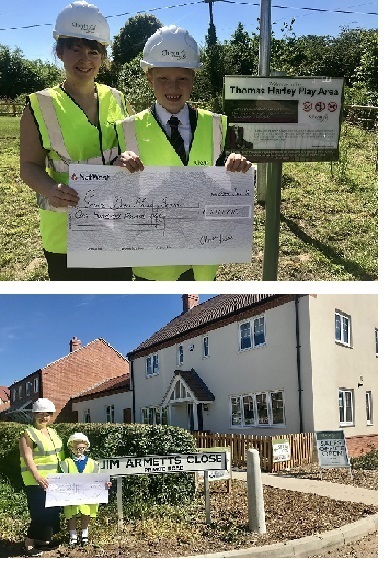 Midlands Based Housebuilder Chevin Homes have unveiled the winning entries from competitions at two local schools to name the road and recreation space at its latest development at Osgathorpe Grange. The winners are Emily Emerson from Griffydam Primary and Henry Bus from Grace Dieu, who named the new street: Jim Armett’s Close, and recreation space: Thomas Harley Play Area. The play area was provided by Chevin Homes as part of its development and will be gifted to the Parish Council, and donations have also been made to the schools who participated in the completions. Sales Manager at Chevin Homes Lisa Osbourne said “We thought it was appropriate to let the local children name the road in the development and also their own play area as they will be the ones to enjoy it, and we are delighted that the names reflect the past history of the Village”. With the majority of homes now occupied, there are only three remaining plots available which are three bedroom ‘Brackenfield’ homes with spacious living rooms and master ensuite, and prices start from just £249,950. Osgathorpe Grange has become a vibrant part of Osgathorpe enjoying a delightful position on the edge of this much sought after Village, which boasts a church and village inn and is situated between the busy market towns of Loughborough and Ashby de la Zouch. It is also handily located between the M42 and M1 which provides swift onwards travel to other nearby regional centres. Birmingham, Nottingham, Derby and Leicester are all within an hours’ drive and East Midlands Airport is just five miles away. As a Government approved Help To Buy house builder, The Help to Buy scheme is available on all plots, and for more information please visit www.chevinhomes.com or call the sales team on 01332 366873.